ClaroLux’s decision to bring their manufacturing back to the USA has completely changed the way their products are manufactured and assembled. Over the past 25 years, almost all of the landscape lighting industry has sourced their products from other countries like China. ClaroLux® is one of the few lighting manufacturers in the United States that is now manufacturing almost all of their lighting products in house, in Greensboro, NC, USA! We are involved in every bit of the production process. From the design of the fixtures on 3D printers to the manufacturing process, ClaroLux® is there, making sure it is done properly. It all begins with a simple idea, then that idea is taken to ClaroLux’s design team to make that idea come to life with their CAD software and 3D printers. The design staff is very involved with their Dealer network so once the designs are printed into a working prototype they are sent out for “real world” testing. Once that feedback is received, ClaroLux® then makes the fixture come to life on their CNC machines. These processes are what sets ClaroLux apart from the rest of their competition. Click on the link below to see why landscape lighting designers and landscape architects across the world are choosing ClaroLux® products to illuminate their most important projects. Their specification grade landscape lighting luminaries are now some of the best products on the market. When you choose a ClaroLux Landscape Lighting System® you will be assured to have the best landscape lighting system on the market that will last you for many years to come. 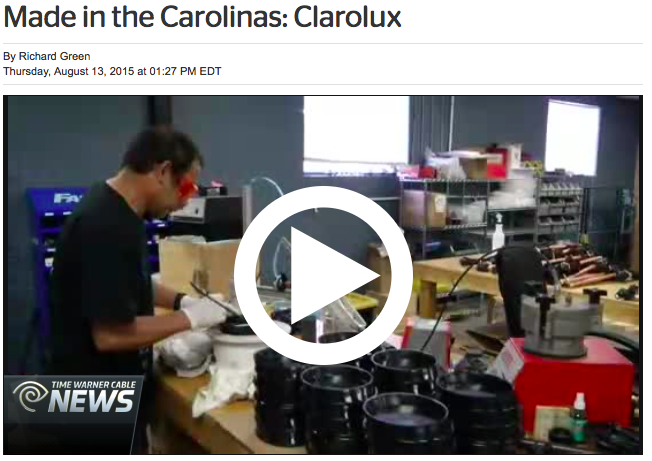 TWC featured ClaroLux Landscape Lighting today on their series “Made in the Carolinas” showing how Made In America is making a big comeback. Click here to see how ClaroLux® is separating themselves from the rest of their competition. Mark your calendar now for the Annual AOLP Conference & Expo being hosted at the Embassy Suites Atlanta in Atlanta, Georgia! The main conference is February 18-20, 2016, with pre-conference certification sessions on February 16-17, 2016. Make sure to register today! Click here to reserve your room for the annual AOLP Conference & Expo!